There's hardly an everyday subject about which people have more confusion and mis-information than color. Even professional scientists are often — perhaps I should even say “usually” — confused about color. The main cause of this widespread confusion is the misinformation we're all fed in grade school. But that really only pushes the question back a step: why are schoolteachers so confused about color? I think there are two reasons. One is that color is by no means as simple a subject as it appears. For example, there are two kinds of color mixing (additive and subtractive). Worse yet, our earliest experiences with color usually are concerned with common technologies like paints or watercolors or crayons; but these media involve a complex mixture of both additive and subtractive color mixing. So our everyday experiences with color can't be analyzed in a simple way. No wonder we're misled by it. The second problem — related to the first — is that our everyday vocabulary of color names is both inadequate and ambiguous. For example, it fails to allow for the three different dimensions of color: we just have a number of named categories (like red, green, blue, purple, white, black, brown, …) that involve different dimensions of color, without distinguishing between them. So we need to have names for the dimensions of color space before we can discuss colors sensibly. Worse yet, discussions of color are often confined to two-dimensional surfaces: the pages of books, school blackboards, computer screens. That makes it even harder to think of color as three-dimensional, because one of the three dimensions has to be suppressed to fit on the two-dimensional surface we're looking at. Hue is the quality that distinguishes red, green, blue, and so on. Saturation is the quality that distinguishes red, pink, and gray of the same hue and brightness. Here's a picture of a pink wedge to illustrate this point: Saturation is sometimes described as the “colorfulness” of a color — i.e., how much it differs from gray. Saturation corresponds to what's called chroma in the Munsell system for denoting surface colors. Brightness corresponds to what's called value in the Munsell system. Common usage misleads us in another way. Lots of color names refer to particular objects or materials: orange, lime, indigo and violet, for example. Having a modest number of distinct, named color categories — associated with distinct crayons or paints or objects from our earliest experience — distracts our attention from the fact that color space is continuous: there is a smooth progression of hues from reds through oranges and yellows, and so on. But our words (as well as our teachers) mislead us into thinking there are just a few “colors” that are somehow distinct. This confusion is compounded by teachers' insistence on three “primary” colors — usually incorrectly chosen as red, yellow, and blue — which doesn't really agree with everyday experience. What we do experience in everyday life is the existence of six unique colors that define the ends of three directions in color space: the complementary hue pairs red and green, and blue and yellow; and the unique ends of the brightness dimension, namely white and black. Another semantic difficulty is that the word “color” is used in conflicting ways in English. Sometimes we use it to describe all possible parts of color space; but in common usage, “color” usually refers to just one aspect of color, namely, hue (which is what distinguishes red from blue and green and yellow). This conflicting usage of the word color leads to fruitless arguments about whether black and white are colors. More confusion is caused by failure to distinguish between color and other aspects of appearance, like luster, texture, and transparency. That leads people to think there are colors named “silver” and “gold”, when these terms really refer to a white or yellow color combined with metallic luster (i.e., strong specular reflection). Still more confusion follows from a failure to distinguish between the physical stimuli that elicit sensations of color, and the sensations themselves. We're accustomed to attribute colors to objects, rather than our responses to them: a blue book, a red chair, and so on. This sloppy habit is reinforced by the phenomenon of “color constancy”: the perception of nearly the same color in an object, even when seen under a variety of different illuminations (daylight, twilight, artificial light, … ) that produce very different physical stimuli. Finally, color is so important in so many fields that conflicting terminology has grown up in different areas: art, photography, color printing, television, and so on. So each field has its own set of words to describe the dimensions of color; even experts who understand color have difficulty understanding one another. If you were taught in school that the three primary colors are red, yellow, and blue, forget it. That's wrong. Color space is 3-dimensional, all right. But before we can talk about primary colors, we need to ask what we want that term to mean. Usually, the idea is that there are 3 colors that can be “mixed” together to form others. But there are different ways to mix colors. The bright, sky-like blue made by adding the green and dark-blue primaries is called “cyan” in the color business. Red added to blue light makes magenta, a more familiar color. And — surprisingly, to many people — red light added to green light makes yellow. But if you take pieces of colored glass or plastic, each colored piece removes some colors from white light. For example, a red filter absorbs blue and green, leaving only red. A green filter removes red and blue; and so on. Obviously, if we stack up a red filter and a green filter, the red one removes the green light, and the green one removes the red light, and they both remove blue light; so we're left with no light at all (assuming the filters are perfect). In subtractive color mixing, red + green = black. So the additive primaries aren't useful for subtractive color mixing. And of course we saw that's called “cyan”, up above. So cyan is “minus red”. And red plus blue is magenta; so magenta is “minus green”. So that's yellow, or “minus blue”. So the subtractive primaries are cyan, magenta, and yellow. Now, how do these subtractive primaries combine? Suppose we take cyan and magenta filters and superimpose them. The cyan takes out the red; the magenta takes out the green; what's left is the blue-violet — the “blue” additive primary. Similarly, yellow plus magneta leaves red; and yellow plus cyan leaves green. The subtractive primaries, paired up, produce the additive primaries. Cyan, magenta, and yellow are the (transparent) inks you'll find in a color printer. Color printing with inks that filter out colors is subtractive color mixing; the inks act like filters. You probably noticed that for every additive primary, there's a corresponding subtractive primary formed by removing that additive primary from white. For example, yellow is (minus blue); so blue and yellow are complementary colors. The other complementary primary pairs are green and magenta, and red and cyan. Notice that white can be produced by adding two complementary colors. In fact, this is really the basis of the idea of complements: any two colors that can be added (in the proper proportions) to give white are complements. They don't need to be primaries. Now, what happens when we mix paints instead of inks? Mixing paints certainly isn't additive; if it were, you could mix red and green paint to get yellow, as we did above with the computer screen. But as everyone knows, red and green paint mixed produce a muddy brown. That's not too far from the black we'd expect from subtractive mixing. But paints aren't exactly subtractive, either. When you stack filters, you get the same transmission regardless of the order in which the light goes through them. But if you paint one color on top of another, you see mostly the top color. Notice that cyan is somewhat like a light blue; so if you ignore the difference between red and magenta, the subtractive primaries might almost be called “red, yellow, and blue”. This is where the story that red, yellow and blue are primary colors of paint came from. But, if you've ever mixed paints, you know this isn't the true story. About the only part of the schoolroom story that works is mixing blue and yellow to get green; and that works, because what's touted as “blue” in school paints or crayons is usually a greenish blue, close to cyan. And, subtractively, cyan plus yellow (which removes the blue-violet part) leaves green. The situation is complicated by the fact that the pigments available to produce colored paints are far from ideal. They don't remove just one additive color, but take out some of each. Usually, the absorption is strongest in the blue and violet, so subtractive combinations end up being a very dark yellow or orange. The yellow square, like the one shown at the left, was generated in PostScript by telling the computer to display both the red and green phosphors at maximum intensity. The orange square to its right was made by asking for full Red intensity and half Green. The two squares below were produced just by asking for half as much of everything. 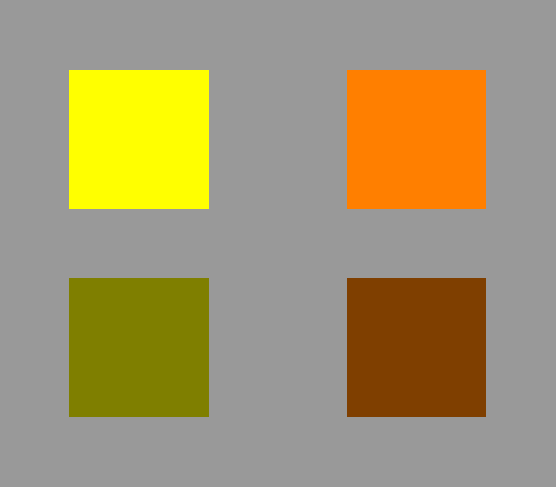 You can see that the darker yellow appears olive green, and the darker orange, brown. The names“yellow” and“orange”are used only for colors of those hues with high brightness. Darker colors of the same hue and saturation are called“olive”and“brown”. Incidentally, what the human visual system considers “light” or “dark” depends very strongly on the perceived context. If I had displayed the orange square here against a white background instead of a medium-gray one, you'd have perceived it as brown rather than orange. There are some vivid demonstrations of this context effect at Edward Adelson's checker-shadow illusion, cut-the-knot.org, and the paper by R. Beau Lotto and Dale Purves, “An empirical explanation of color contrast” (Pub. National Acad. Sci. 97, 12834–12839 (2000), which you can download as a PDF file if your institution subscribes to PNAS. The most striking demonstration, by Al Seckel at Caltech, is currently off-line. The color that was called “magneta” above is an example of a class of non-spectral colors called purple. (The term “non-spectral” means that these colors do not appear in a spectrum.) The purples are complementary to various shades of green. Rainbows are natural spectra — although they're relatively insipid ones, compared to what can be seen in an optics laboratory, or displayed on a computer monitor. What's important here is that “all the colors of the rainbow” does not include all the colors: the purples are missing. And of course the dark colors, like brown and olive, aren't in rainbows, either. There's a great set of Web pages on color at http://www.handprint.com/, starting with the page on color vision. This material is all written from the point of view of a user of watercolors, so it should be easy reading for anyone who has passed through grade school. There is, however, a lot of stuff there. Take your time and read through it. You'll find it quite worth while. For people who have a professional interest in color, Charles Poynton's COLOR FAQ has become a standard reference on the Web. I've also made an old tutorial article on color for technical readers available here. It explains how to calculate the color of an object if you know its spectrum.